Swaraj's meeting with Wang comes just days after National Security Advisor Ajit Doval met top official of the ruling Communist Party of China (CPC) Yang Jiechi in Shanghai. External Affairs Minister Sushma Swaraj with her Chinese counterpart Wang Yi. 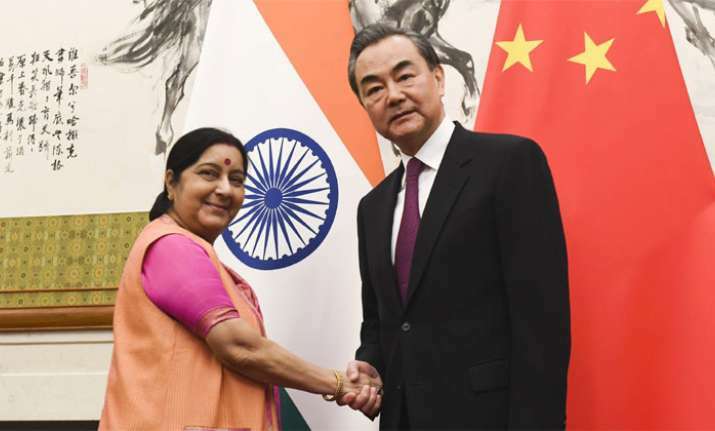 On the second day of her four-day visit to China, External Affairs Minister Sushma Swaraj on Sunday met her counterpart in Wang Yi in Beijing. The two leaders discussed a range of issues aimed at improving ties between the two Asian powers. Hours later, reports emerged that PM Narendra Modi will be visiting China on April 27-28 to hold talks with President Xi Jinping. Swaraj, who is in Beijing to take part in the foreign ministers' meeting of the Shanghai Cooperation Organisation (SCO), also congratulated Wang for his elevation as state councillor, which means that he is now the top diplomat of the country. Wang said the bilateral ties have witnessed a good development and shown a positive momentum this year under the guidance of the leaders of the two nations. "On the eve of the closing of China's National People's Congress this year, President Xi Jinping received a very important phone call from Prime Minister Narendra Modi," he said, adding that the call spurred a positive momentum in the dialogue process between the two countries. "Our two leaders had in-depth exchange of views and reached important consensus on furthering the China-India relationship. We must work very hard to implement the consensus between our two leaders," the Chinese Foreign minister said. Both India and China have been working to increase the dialogue process to scale down tensions in the wake of Doklam standoff last year.